All species are added to this site as individual posts. If you saw a critter, but aren’t sure where to start with identification, try browsing through all the photos on my site. The “Wildlife Categories” section in the right sidebar can help you drill down into some of the larger collections of wildlife types represented on this site. Categories are not meant to represent a complete scientific order, but rather are added out of logic or necessity. If I happen to have a lot of birds from a certain group or family, I will make a new subcatgeory for them. The “Wildlife Tags” area will provide more precise characteristics related to species and color. The tags should greatly improve your search results. Every animal receives at least one color tag, which should help identification greatly. For example, if you have a butterfly that’s orange and you’re not sure what family it’s in, searching “orange butterfly” should return what you’re looking for. The search is pretty solid, and I’m trying to improve it with filtering options. By no means does this site contain an all inclusive collection of wildlife. If you need some further help identifying certain species, I have researched some sites that may be of assistance. As I pick up field guides and references I’ll post the good ones here. Great book includes easy to follow section organization, pictures for both open winged and closed wing views. Kauffman includes scientific names and visual differences for male and female members of species. One of the most welcome aspects is that the author specifically points out characteristcs and species details to aid in identification, such as unique markings or coloring. Range maps are also included for each species with detail for seasons and migration paths. Colored tabs help you flip through sections quickly. The listing of Skippers is massive. 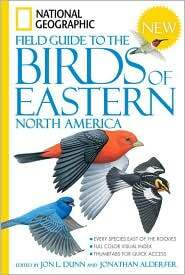 This field guide is a great book for bird watchers. The breakdown for Eastern North America proves extremely helpful, as it allows better detail to be paid on individual species, than a book that attempts to cover all of the United States or North America. The guide includes a number of filtering options including 6 large sections to address the book’s overall content, a quick index on the front flap, visual index of bird familes inside the front and back covers, and complete species index in the back. Individual entries include visuals for rest and in flight, regional maps, size and general description. There is also a line in each entry to describe the species voice. The color photographs include differentiations for male and female and juvenile, wherever possible. I like Kaufman’s butterfly book so well that when I was looking for a resource to help me better define some of the beetles, dragonflies, common bugs and fly species I was coming across, I went back to Kaufman again. The subject matter here is so vast, and obviously, the field guide doesnt have the room to go into detail with range maps and comparison on each species, as the butterfly book did, but Kaufman still provides full color photos, descriptions and great organization. The Pictoral Table of Contents at the beginning helps you get to the section you need fast and the number of photographic examples is great. For dragonflies and damselflies, I didn’t feel like there was enough example, but with the vast species and stark differences between male and female, that’s a bug that probably needs its own book. The beetle and fly details are great, and his breakdown of bees and wasps has been a big help. The comprehensive index in the back is all inclusive. When I come across a subject like birds, which are often very exclusive to regions in the U.S., I don’t need all the information about Florida and California and the midwest. I’m focused on Maryland and the 200+ birds here, so give me Maryland. 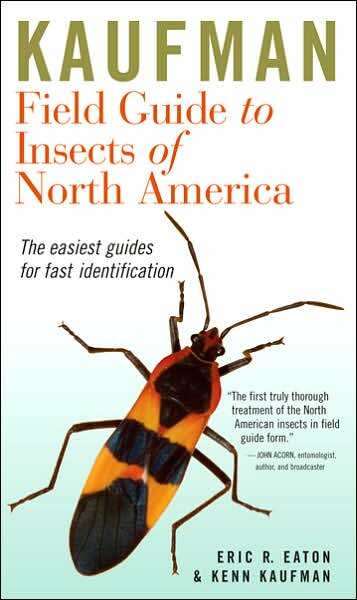 Enter this field guide by Stan Tekiela that comes closer to locking it down and is easier to use than any other book I have come across. For each entry, the guide includes a full color photo, range map, scientific names, size and various other notes. But there are two unique facets that set the book apart and make life easy on a novice identifier. 1) The species are organized by color, rather than by species or family or anything that most people don’t know anyway. So if you see a bird that’s brown, turn to the mostly brown section and start flipping. It couldn’t be easier. 2) Each species entry also includes a “Compare” section. This is another fantastic feature. If you find an entry that’s close, but not type the bird you saw, use the compare feature to find a similar species, fast. 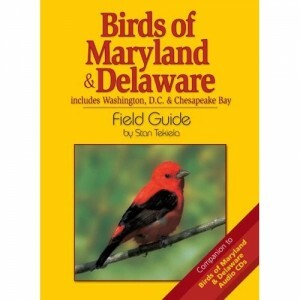 Great book; highly recommended for Maryland and Delaware watchers.